What do you consider as a great camera? Pixel counts? Screen size? Weather seals? Continuous shooting rates? Photography monthly has an article on The 50 Greatest Camera of All Time, of which you find all sorts of cameras in the list whether it’s film, digital, Canon or Nikon. 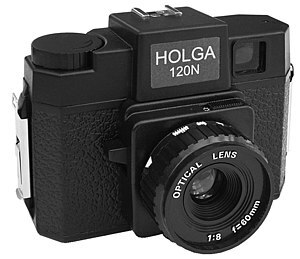 The Holga 120N at No. 24, is not the sharpest nor sturdiest camera you can have. I like the Holga for what it is – cheap, plastic, light leaking, soft and surreal lens and somewhat heavy vignetting. It is as if it has its own personality, its own appealing aesthetics. The result on film is so inviting, I can’t help but to look at the photograph for a couple of minutes. It displays the most basic element of a photograph, with no regards to pixel count or sharpness. Check out David Burnett’s Holga Eye gallery to see what I mean.